One could argue that last week’s announcement of the proposed merger of two of the world’s largest magnesia and refractory groups – RHI AG’s takeover of Magnesita Refratários SA to form RHI Magnesita – was only a matter of time. RHI Magnesita will fuse together the world’s second and third largest refractory groups, pooling an impressive stable of refractory producing facilities and considerable refractory raw material resources, dominated by magnesite and dolomite. Mega-Mag-Merger: Magnesita’s vast Pedra Preta magnesite mine, near Brumado, Bahia, Brazil, which provides >1m. tpa feedstock for dead burned and caustic calcined magnesia production could be joining RHI’s equally impressive magnesite resources in Austria (Ibar Nordeste’s magnesite mine is in the background, soon to be exporting its DBM production). The potential of such a move was most recently signalled in June this year by Magnesita’s formation of Magnesita International Ltd in the UK and its intention to list on the London Stock Exchange’s AIM – the rationale was described as being “in the context of strengthening the image [of Magnesita] as a global player”. Octavio Pereira Lopes resigned as CEO of Magnesita and was appointed Chairman of Magnesita International Ltd (apparently remaining leader of the Magnesita Group with regards to international operations), while former Technical & Raw Materials Director, Luis Rodolfo Bittencourt, was appointed the new CEO of Magnesita in Brazil. Magnesita also announced plans to relocate its executive board to a London headquarters, although Brexit has somewhat thrown a spanner in the works here, and now the Netherlands is being eyed for the new headquarters. In July 2016, the Brazilian group then divested its talc business for US$55m, presumably deemed “non-core”. This was a not an inconsiderable asset, and a rather nice addition for Italian talc leader IMI Fabi SpA’s growing portfolio, bolstering its position behind Imerys and Mondo Minerals as third leading western talc producer. 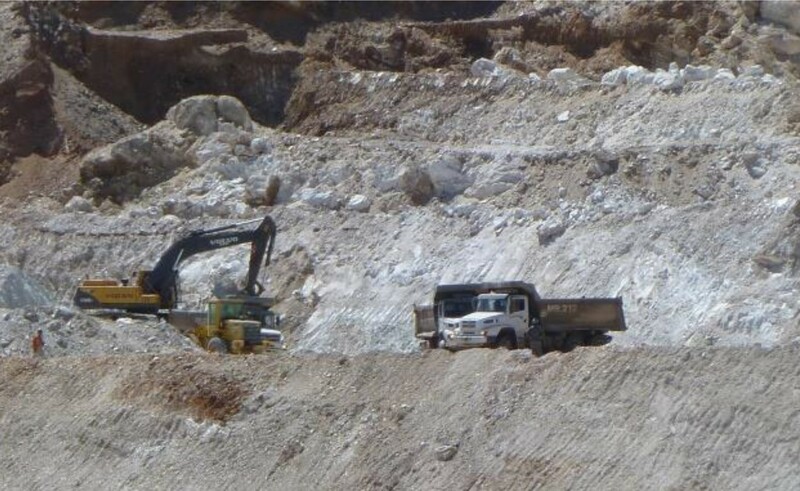 Mining talc at Magnesita’s Cabeaceiras mine very close to the magnesite operations. This asset was sold to IMI Fabi SpA of Italy in July, in advance of the RHI Magnesita deal. Magnesita produced around 1.5m tpa crude talc from the Cabeaceiras mine, hosting 11m tonnes talc reserves (neighbouring its magnesite operations in Bahia) and producing around 44,000 tpa high grade talc for filler markets. In 2015, the talc business generated US$ 14m in revenue. Otherwise, it has been widely regarded by industry observers that the world refractories industry was ripe for further consolidation and an RHI-Magnesita deal had been mooted some years ago. 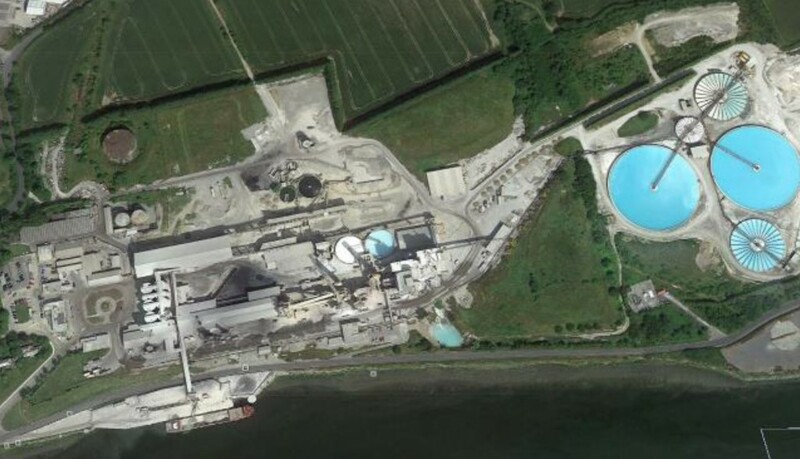 Back in 2011 the prospect of such a consolidation between RHI and Magnesita became a hot topic as both groups were preying on each others’ home turf – Magnesita grabbing ThyssenKrupp steel contracts in Germany, RHI building a refractory plant in Brazil (subsequently placed on hold in the face of punitive antidumping import duties). Nevertheless, the news still arrives with some impact, as the merger of these two giants of magnesia and refractory production brings under one roof a significant array of refractory raw material assets, which are examined later, as well as refractory manufacturing plants worldwide. Announced on 5 October 2016, RHI’s Management Board has agreed to sign a share purchase agreement with Magnesita’s controlling shareholders regarding the acquisition of a controlling stake of at least 46%, but no more than 50%, plus one share of the total share capital in Magnesita. The purchase price for the 46% stake will be paid in cash amounting to €118m and 4.6m new shares to be issued by RHI Magnesita, a new RHI entity to be established in the Netherlands and listed in London. Based on RHI’s six-month volume-weighted average price of €19.52, the implied value of the 46% stake amounts to €208m. As a result of the transaction, GP Investments (a controlling shareholder of Magnesita) will become a relevant shareholder of RHI Magnesita. The migration of RHI is to be effected by RHI Magnesita becoming the ultimate holding company of RHI Group. Completion of the deal is subject to approvals including the relevant competition authorities, the migration of RHI to the Netherlands, and the listing of RHI Magnesita’s shares in the premium segment of the Official List on the Main Market of the London Stock Exchange. Completion is expected in H2 2017. Until then, the two companies will remain completely separate and independent. Following completion, a mandatory tender offer will be launched by RHI Magnesita or one of its affiliates for the remaining shares in Magnesita. In its statement last week, RHI expected the combined company to generate fully consolidated revenues of €2.6-2.8bn with an operating EBIT margin of more than 12%. Magnesita made a London share listing a precondition for its takeover by RHI, but owing to the UK vote on 23 June to leave the European Union the group now has to find a place other than London for the headquarters of RHI Magnesita. Therefore the new company is to be established in the Netherlands to remain subject to European merger rules, while its shares will be listed in London. Had the Brexit vote failed, then RHI Magnesita would most likely have been based in London. RHI is to be delisted from the Vienna Stock Exchange. Just before announcement of the takeover, RHI appointed Stefan Borgas as RHI’s new CEO with effect from 1 December 2016. Dr. Wolfgang Ruttenstorfer will continue to be available as interim Chairman of the Management Board until 30 November 2016. This is a process that has been ongoing for some time and which has radically reshaped the corporate landscape of the sector. But it has needed to. The main end use sectors for refractories are global heavy manufacturing industries which have also consolidated in similar fashion across the world: steel, cement, ceramics, glass, lime, nonferrous metals. Drivers for the these markets are primarily regional economic performance, construction, and urban development. 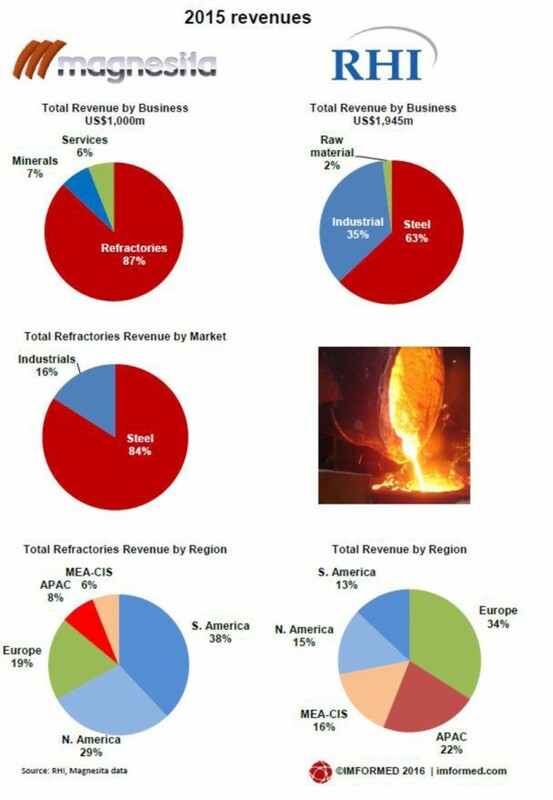 In order to conserve costs in production, sourcing, and logistics (especially in the face of low cost Chinese exports of both refractory raw materials and end products), as well as maintain an efficient global sales and distribution network, the refractory industry has shrunk considerably in the last three decades to just a few multi-national players leading the field, followed by a few medium sized companies (see chart). Each of the top four refractory groups are the resultant amalgamations of massive mergers and acquisitions during the 1990s and 2000s: Vesuvius (Hepworth, Foseco); RHI (Veitsch-Radex, Didier Werke); Magnesita (LWB Refractories); Calderys (owned by Imerys: Plibrico, Lafarge Refractories). Some of the companies following them have also followed this trend: Krosaki/Harima, HarbisonWalker International (formerly ANH, the collective of AP Green, North American Refractories, and Harbison Walker Refractories). RHI Magnesita will be the fusion of the world’s second and third largest refractory groups, which will see it move above the current top spot held by Vesuvius. The merger enables a far superior global reach for both companies which would have otherwise remained a challenge, especially in bringing Magnesita to Europe and RHI to the Americas. Both companies complement each other on basic refractory technology, particularly in magnesia and dolomite refractories, and in operations in China. However, it is their combined refractory raw material resources which also stand out to be examined. Regarding raw materials, the common bond between RHI and Magnesita has been their pursuit of self-sufficiency in key refractory raw materials, each having achieved somewhere in the region of 80% self-sufficiency – mainly in dead burned magnesia (DBM) and fused magnesia (FM). Although the vertical integration trend kicked off in earnest in the mid-2000s, with RHI making some major magnesia acquisitions and investments, and Magnesita expanding its DBM capabilities, both companies have roots in magnesite mining, if not pioneering the development of refractory magnesia grades. That is, they were already captive mineral producers from the start. Which might explain perhaps why most other leading refractory producers have not followed suit, as was anticipated to a certain degree. In other words, unless you are an existing captive refractory mineral producer, starting from scratch might be a challenge too far. some specific captive production, eg. : Vesuvius (fused silica), Ropczyce (fused magnesia), Refratechnik (fused magnesia), POSCO (magnesia), Saint-Gobain (silicon carbide), Kerneos (bauxite). 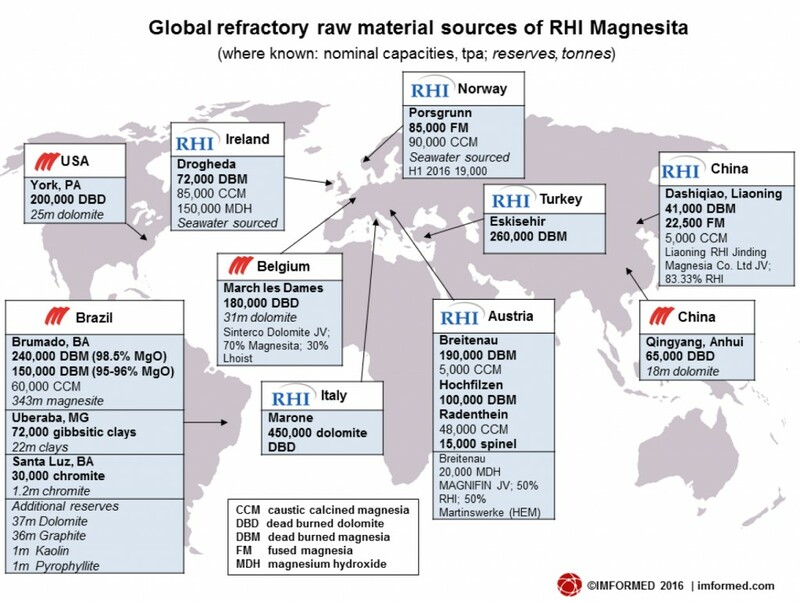 The accompanying map illustrates an overview of the combined refractory raw material sources under the proposed new company RHI Magnesita. Immediately apparent is the consolidation of two of the world’s leading DBM producers, which will now result in a magnesia group to rival Magnezit, Russia in size, and overtake SMZ, Slovakia and Kumas, Turkey in capacity. 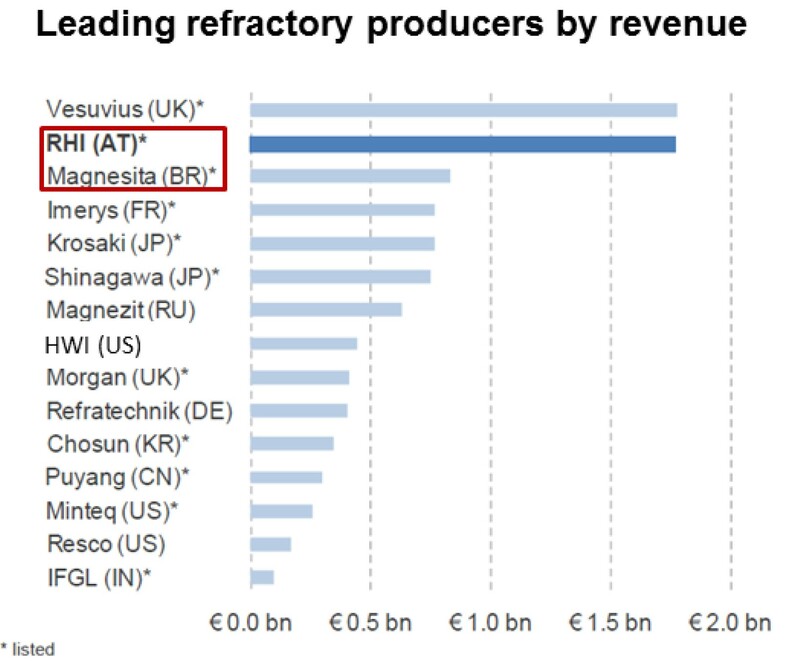 RHI also has two synthetic magnesia sources using seawater, in Ireland and Norway to produce DBM and FM, respectively. The majority of DBM is for captive use in refractories production, but both groups also sell to the external market. In 2015, Magnesita’s Industrial Mineral sales accounted for 6.6% of Magnesita’s consolidated revenue for the year, against 5.5% in 2014. 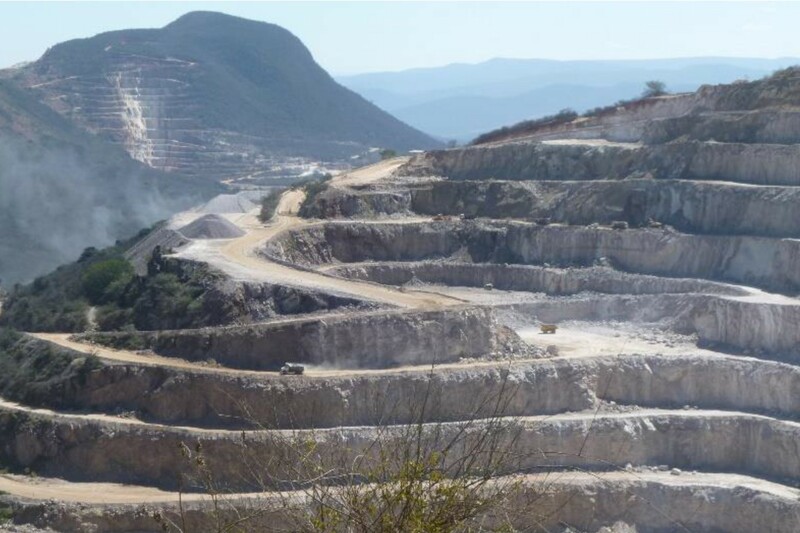 Mineral sales revenue totalled US$65m up 40.8%. 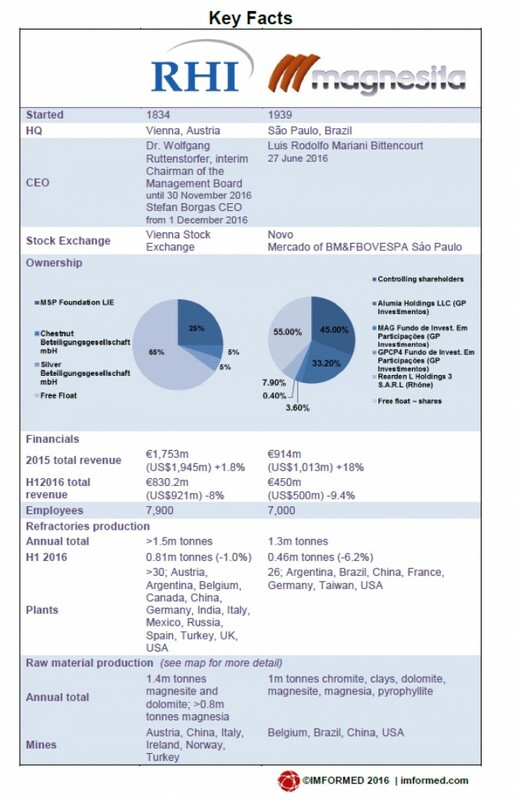 Magnesita explained the rise as mainly down to a 160% increase in DBM external sales, driven by higher productivity in Brumado combined with a decrease in refractory volume production. Thus DBM was the single largest external mineral sale in 2015 accounting for 29%, over 12% in 2014. Another key point is the reinforcement of refractory grade dolomite resources that is brought by Magnesita, the world leader. RHI has one source in Italy, but Magnesita is active in the USA, Europe, and China. Although dolomite is mostly mined for feedstock for dead burned dolomite production for refractories, dolomite is also sold for non-refractory applications, such as slag conditioning. In 2015, RHI saw its raw material external sales increase by 63.2% to 297,000 tonnes in total . This was primarily due to sales of raw dolomite from Italian subsidiary Dolomite Franchi SpA which made a “significant contribution to volume”. The trend appears to continue in 2016 with H1 2016 total sales up 26% to 180,000 tonnes. Both groups have limited raw material operations in China, but to have at least some presence in China is a good thing for this industry. Just to complete the magnesia portfolio, both groups produce caustic calcined magnesia (CCM) for DBM and FM feedstock, but also for a range of non-refractory markets. Additionally, RHI is active in magnesium hydroxide (MDH) production in Ireland and through MAGNIFIN Magnesiaprodukte GmbH & Co KG in Austria, a 50:50 JV with Martinswerke GmbH (now part of Huber Engineered Materials). In Brazil, Magnesita also offers an interesting mineral reserve portfolio of graphite, chromite, kaolin, gibbsitic clays, kyanite, and pyrophyllite to complement its mainstream magnesia and dolomite production. The drive for vertical integration, while laudable and understandable in seeking alternatives from inconsistent Chinese supply availability and pricing, is not without its pitfalls. RHI has reduced output at its new 85,000 tpa fused magnesia plant in Porsgrunn, Norway, built to negate purchasing Chinese FM. The €75m plant opened in late 2012, however, a year on and production was around 35,000 tpa owing to energy costs and technical issues, which have since been addressed. With the dramatic drop in Chinese fused magnesia prices during 2015-16, this has further compounded the plant’s position. During H1 2016 19,000 tonnes FM was produced. Lower qualities of fused magnesia are now purchased from China at a lower price, while the Norwegian raw material is used for high quality grades for the steel industry. In Brazil, Magnesita was keen to develop a 40,000 tpa graphite mine in Almenara, Minas Gerais, with measured and indicated resources of 12m tonnes of graphite with an average grade of 2.2% graphitic carbon. Much interest was garnered in 2012, however, the mine life was estimated at just six years, and the project was suspended in late 2014. Whether any impetus will stem from RHI Magnesita remains to be seen, although with the emerging battery market consuming more graphite, a second look at this project would not be surprising. It will probably take until late 2017 or even early 2018 to allow the dust to settle and take stock of any potential structural changes to the RHI Magnesita raw material portfolio. 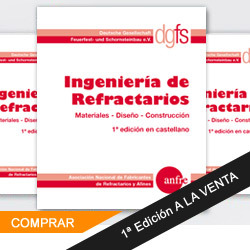 In any event, it remains one of the greatest mergers in the refractory industry’s evolution.